The new generation Yamaha R15 V3 is expected to launch in India later this year or in early 2018; to come more powerful, feature-rich, safer and sportier. The Indian customers, specially the new-generation buyers are leaning toward more sporty bikes than simple boring commuter models. The stylish global design and high performance of the Yamaha R15 have simply grabbed attention of the young-gen speedsters. The R15 received its last update in 2011 when the Japanese brand introduced the updated model christened as the R15 V2.0. Also, later in 2015, the company introduced the R15 S with design tweaks for conventional pillion seat and it comes cheaper comparatively. Now, the two-wheeler manufacturer is preparing to launch an all-new generation of the R15, which is expected in India sometime this year or in 2018. Yamaha claims the bike has become more powerful and sportier in its new avatar. While the R15 V3 is preparing to arrive in Indian market, Yamaha’s Indonesian arm has revealed the bike in flesh already. Yamaha is yet to reveal the specific details about the launch of R15 V3 for the Indian market. But it could launch sometime in late 2017 or in the early parts of next year. Yamaha R15 V3 India Price The current model of Yamaha R15 V3 is priced at Rs. 1,25,825 (ex-showroom, New Delhi). Expect the upcoming model to be priced under Rs. 1.5 lakh (ex-showroom, New Delhi). However, if Yamaha can position the model more competitively, we expect increase in audience for purchasing than at present. The Yamaha R15 V3 is powered by an all-new bigger 155 cc single-cylinder, fuel-injected, SOHC, liquid-cooled, four-stroke engine. Paired with a six-speed transmission, this engine churns out maximum power of 19.3 hp at 10,000 rpm and 14.7 Nm of peak torque delivered at 8,500 rpm. The current generation Yamaha R15 draws power from a 149 cc single-cylinder, liquid-cooled, four-stroke engine; which is mated to a 6-speed transmission. This engine kicks out 17 PS of peak power at 8,500 rpm and 15 Nm of peak torque at 7,500 rpm. It also returns a fuel efficiency of 42 kmpl and the bike can run at a top speed of 130 kmph. To reach 0 – 60 kmph, the present R15 takes 4.89 seconds. 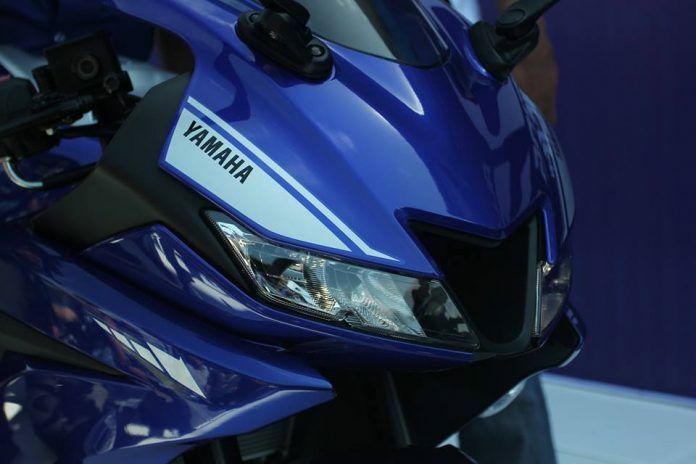 Expect the upcoming model to come faster than R15 V2 as the engine is equipped with Yamaha’s VVA (Variable Valve Actuation) technology for improved performance at higher revs. This is to offset the low torque and provide more tractable powerband and power across the whole rev range. The V3’s motor also has a higher compression ratio compared to the existing 149cc engine. The new R15 V3.0 measures 1,990 mm in length, 725 mm in width and 1,135 mm in height. This implies it is 30 mm longer, 55 mm wider and 65 mm taller than the V2.0. With 25 mm shorter wheelbase to 1,325mm, the fully-faired bike has all the ingredients to be agile while the increase of seat height by 5 mm to 815 mm will offer more aggressive riding position. It tips the weighing scale at 137 kilos – one kg more than the outgoing model. Braking duty in the Yamaha R15 V2 is done by a 267 mm front disc brake and a 220 mm rear disc brake. For the suspension duty, this bike gets telescopic front fork and linked type monocross rear suspension. Expect the upcoming model to come bearing same braking and suspension set-ups. Many R15 fans hoped that, the new generation bike will come equipped with an upside down (USD) front fork and their prayers met with a positive result. It rides on beefier 100/80-17 and 140/70-17 tyres. The existing model runs on 17-inch blackened 5-spoke alloy wheels wrapped in tubeless tyres. 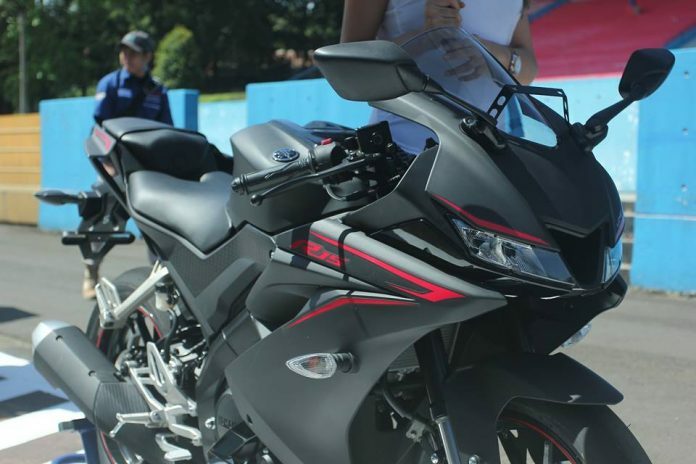 The Yamaha R15 V3 is claimed to be sportier looking and sharper than the outgoing model. It takes design cues from its other siblings YZF-R125 and YZF-R6. As the spyshots suggested, it gets plenty of updates at front. The LED headlamp cluster is split by a central vent that aids aerodynamically. The front fairing of the R15 V3.0 looks sharper and more muscular. Based on a deltabox chassis, it boasts improved aerodynamic efficiency than the current model and of course with more lean-angle. It gets an all-digital instrument cluster while the 11-litre muscular fuel tank in the new generation R15 is one litre lesser than the existing model. Apart from that, the tail section has been upgraded to look more leaner and meaner. It gets split seats, with the pillion seat stepped up, enhancing its sporty appeal. The pillion seat now is claimed to offer more comfortable seating experience – a major problem buyers face in the model. The sleek LED taillight, rear mud-guard and upwardly positioned machine-gun muzzle like exhaust also stay unchanged. The new generation Yamaha R15 could sport new colour schemes with racing blue and grey/white/red combo while the alloy wheels could don a red rim decal, which will surely make the performance motorcycle even more appealing when it reaches India. Along with all the major changes incorporated, the new R15 V3 is expected to impress buyers in India yet again. Upon its launch, the Yamaha R15 V3 will take on the tough rival like Honda CBR150R, Hero Karizma and price-wise it runs close to the Bajaj Pulsar RS200 and even the KTM Duke 200 to some extent.